I see my medical providers more than the average person. Often times I am asked why I go to the doctor so frequently, since I’m now living a healthier lifestyle. This is an easy question to answer. My desire is to have a true health plan (that my providers and I have agreed upon) and to keep myself on pace with this plan. What’s the point in waiting until you get sick to see your doctor, when perhaps a visit while you were healthy could have prevented that illness from occurring in the first place? If you have a legitimate health plan, waiting until you get sick to see the doctor seems awfully counterintuitive. Individual health begins with the individual. I firmly believe that you must be in the driver’s seat of your healthcare vehicle. It is not anyone else’s responsibility, especially not an insurance company, to maintain your health. The amount of time, effort and money spent on interventional medical care these days is simply astronomical. Having an established health plan in the first place could render much of this care unnecessary. Instead of relying on scientific medical advancement to bail you out, grab the steering wheel and come up with a plan that can potentially save you from acquiring an irreversible non-communicable chronic disease. I have come to be labeled as a “food snob” in social circles as a result of adhering to my health plan. I do not feel bad for bucking the status quo when it comes to food, as I am simply following my health plan. A rather extreme, yet reasonable, example of following my health plan is when I travel for business. Over the past 2 years, I have stayed at the same hotel about 40 times. This particular chain of hotels offers a complimentary self-serve breakfast in the lobby each morning. These popular and well-attended breakfasts typically consist of cereal, milk, pop-tarts, instant oatmeal, waffles, syrup, muffins, fruit juice, etc. I pass on this food on each and every visit. It is for a legitimate reason. These foods are not aligned with my health plan. When I look at the spread in the lobby, I do not see the foods as I described them above. What I see is processed foods with preservatives, hormones, refined sugar/flour, high fructose corn syrup, etc. If I ate there on every visit, my glycemic index would be off the charts and my health plan would be compromised. More simply put, it is not the quality of food that I want to put in my body. It is essentially the type of “status quo” food that I feel is making a lot of Americans sick. The bottom line is that managed care is in your hands. No one cares about you more than you do. Managing your care, from the standpoint of nutrition, means not blindly settling for the status quo when it comes to the choices you make. It’s important to realize that the entire food industry operates on the basis of supply and demand. The industry will produce more of what you will buy, so they can make a profit and run a sustainable business. This is totally understandable, reasonable and appropriate. However, there are no guarantees that the food they produce is good for your health. A lot of the food they produce is not good for your health. Be smart about the ingredients you are purposely putting into your body. Don’t settle for “All Natural”, “Low Fat” and “1/3 Less Sugar” meaningless claims on product packaging at your supermarket. Don’t settle for the fact that many restaurants cover everything on your dinner plate with butter and salt to enhance the flavor, because that is the way it is “supposed” to be prepared. You are in charge of the way that things are “supposed” to be prepared, based on your established health plan. It is never too late to get started on managing your own care and creating a health plan. At your next annual physical exam, ask your medical provider what you can do to proactively keep yourself optimally healthy. That is how it all started for me a few short years ago, and I will be forever thankful that I asked my doctor that important question. As far as insurance, I love this attitude. As a former dentist I can say that prevention is at the heart of the model of dentistry. If only medicine could start to adopt this principle. 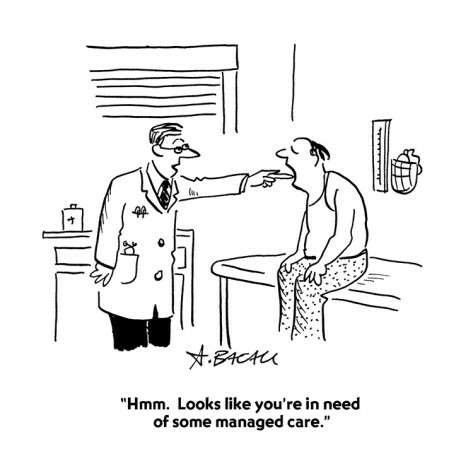 But as you say managed care should really be about taking responsibility and managing your own care. Bravo! I really appreciate your perspective as a former provider of patient care. There is so much public awareness these days regarding wellness and disease prevention. Going forward, I foresee an increasing amount of people developing “health plans” that are more proactive than reactive. It is certainly our best bet for sustainability. Thanks for your comment!